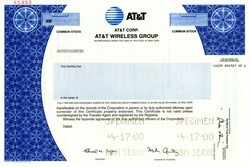 Beautifully engraved specimen certificate from AT&T Wireless Services, Inc dated April 17, 2000. This historic document was printed by the American Banknote Company and has an ornate border around it with a vignette of the company's logo. This item has the printed signatures of the Company’s Chairman, Michael Armstrong, and Treasurer. In April 2000, AT&T Wireless became a separately traded entity with the world's largest initial public offering at that time. Just over a year later in July 2001, AT&T Wireless became a separate company rather than a division of AT&T Corp.
AT&T Wireless Services, Inc., founded in 1987 as McCaw Cellular Communications, Inc., and later known as Cingular Wireless Services, Inc., formerly part of AT&T Corp., is a wireless telephone carrier in the United States, based in Redmond, Washington, and later traded on the New York Stock Exchange under the stock symbol "AWE", as a separate entity from its former parent. On October 26, 2004, AT&T Wireless was acquired by Cingular Wireless, a joint venture of SBC Communications and BellSouth, to form the largest wireless carrier in the United States at the time. On November 16, 2004, AT&T Wireless stores were rechristened under the Cingular banner. The legal entity "AT&T Wireless Services, Inc." was renamed "New Cingular Wireless Services, Inc."
In late 2005, SBC (the majority partner in Cingular) acquired the original AT&T, and rebranded as "the new AT&T". Cingular became wholly owned by the new AT&T in December 2006 as a result of the new AT&T's acquisition of BellSouth. After the merger, Cingular was renamed AT&T Mobility in early 2007 and remained the largest wireless carrier until 2009 when Verizon Wireless acquired Alltel to retake its position as the number one carrier. AT&T Mobility LLC, formerly known as Cingular Wireless and marketed as simply AT&T, is a wholly owned subsidiary of AT&T that provides wireless services to 131.8 million subscribers in the United States including Puerto Rico and the U.S. Virgin Islands. AT&T Mobility is the second largest wireless telecommunications provider in the United States and Puerto Rico behind Verizon Wireless. AT&T Mobility is headquartered in the Lenox Park area of Brookhaven, Georgia, just outside Atlanta.